Growing plants seem overwhelming to most people. They make up all sorts of excuses. “Oh, there is no space in the house. I don’t have time. I don’t have a green thumb.” But it is actually very simple. You don’t need to have a green thumb to grow in a small scale. When you are tired and your eyes are aching, just observe your plants. Just watch them being there doing their thing in their own quiet way, makes you feel so good! I tell you it’s completely worthwhile. I still remember each and every plant in our house in the village. During summer, my mother would draw water from the well and fill buckets and pots, and we would water all the plants. When my young cousins came to visit us on month-long summer vacation, they would also give a helping hand. The cool shade of the backyard was my favorite place to be. They knew my joys and sorrows. Every friend/relative who came home was proudly shown around. Even strangers who walked past our compound would stop and admire the rare fruits like Sitaphal, Anar, Bablimos (grapefruit), and of course Jackfruit. Some of them even rang the bell and requested for a fruit, and if it is ripe enough, we would gladly give it away. My father has a good green thumb. He grows banana, lady’s-finger, chilies, amaranth, drumstick, and he takes care of them so well. Green thumb or not, I try to plant too in my own little way in the little space I have. I started off with flowering plants. This is a desert rose bonsai. Low maintenance and flowers throughout the year. My neighbor (a widower who had been living alone for many years) could see this plant from his window. He used to say that although the plant didn’t belong to him, he felt so happy whenever there was a new flower. These are called Nityakalyani in my native. These are also low maintenance and flowers daily. These two plants could survive up to a week without water. When I moved houses, the plants too moved with me. But when I moved out of the city, I had to give them away to a nursery to ensure that they are looked after well. Now I don’t grow any flowering plants. I feel that it is better to grow plants that can be used in daily cooking. 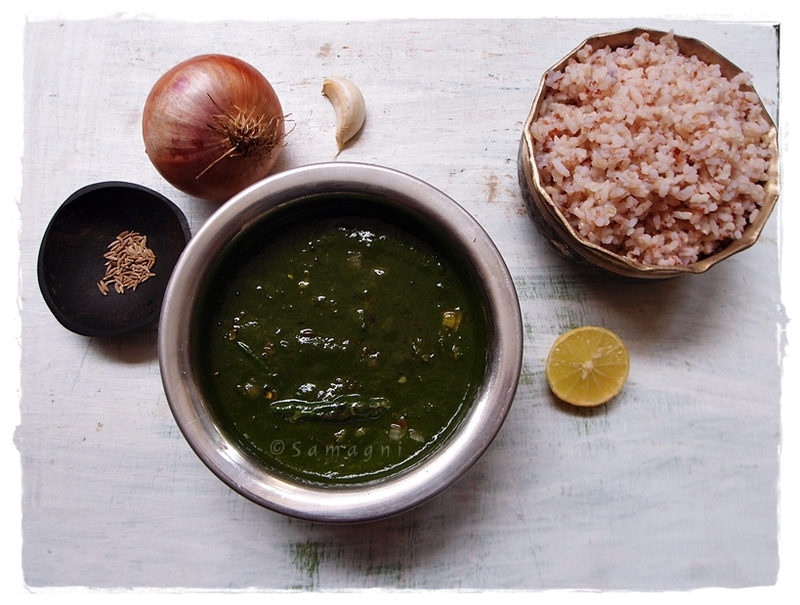 Even if it is just a sprig of curry leaf, it feels good to be self-reliant. Once after having pasta that had fresh basil on it, it occurred to me why not grow my own basil? I bought basil seeds from the geekgardener’s store. Each seed I planted sprouted within 3-4 days. The leaves smell amazing. If you just touch the leaf, the smell lingers on your finger for a good five minutes. See how healthy my spinach plant looks! Can you believe, it just came up from the leftover roots of the palak that I bought for cooking? If the spinach that you bought from the market has its roots intact, instead of throwing it in the bin, just stick them into a pot of soil and water daily. You can grow coriander also in the same way using leftover roots. Don’t tell me you don’t have space to keep a money plant in a corner! All you need is to immerse the plant in a jar of water. Once a week or so, check the water levels and add water as and when necessary. Seeing new tendrils sprout is sheer joy! Indoor plants have many benefits. Not only do they purify the air, they also reduce your fatigue and stress. Fill up small pockets of your house with indoor plants. Take them out to meet the sun over weekends. It is simple to grow methi (uluva) also at home. Soak the methi seeds (that you use for cooking) in water overnight. Sow them in a pot and in 3-4 days you will notice sprouts. I treat my plants like members living in my house. I give them their water soon after I wake up. I check how they are doing. Each new sign of life is newfound joy. I feel sad when a leaf turns yellow. Before I pluck a leaf (for cooking), I “take the plant’s permission” and pluck the leaf gently without hurting the plant. I am aware it does not “hurt” them. (Plants are not sentient. They do not have a central nervous system.) Yet this is my way of showing respect to the plant. They are our only source to anything that we consume. I do not water my plants after sunset and never before sunrise as I feel plants sleep during this time should not be disturbed. If you have taken a walk at a park during sunset, you might have noticed that the leaves of some plants fold together in a touch-me-not leaf kind of fashion. Not all plants display a visible sign of “sleep” but some do. There is scientific proof that at night plants shut down their system by closing their stomata and stopping food production. If you have more information on this, please do share with me. Growing plants is a beautiful experience. It enriches your person. Do give it a try. Spinach is one of the healthiest vegetables and ranked number one in nutrient richness. It is full of minerals and vitamins and provides anti-inflammatory, anti-cancer, and antioxidant properties. Spinach helps keep bones healthy. A lot of nutrients and vitamins are lost during cooking. Raw consumption provides you with all the benefits that this miracle leaf can offer you. I could go on endlessly about the benefits of spinach consumption, but before you frown, let me give you the recipe to this simple salad. It is as easy as tossing some lemon juice, olive oil, nuts, and some cheese into your cleaned spinach leaves – an amazing way of satisfying the body’s need for green leafy vegetables. It is very important to wash the spinach thoroughly before consumption. Soak the leaves in clean water for at least 15 minutes and rinse. Wash the spinach leaves thoroughly, drain, and dry. Use your hands to tear the spinach leaves into smaller pieces as desired (I did not use a knife because chopping into smaller pieces would mean loss of nutrients). Add walnuts, cashewnuts, lemon juice, and olive oil. I added pumpkin seeds and sunflower seeds also. I did not add salt to this salad because I loved the as-is taste. Mix the ingredients to coat evenly. The cheese, nuts, and the lemon give this salad a tangy and nutty flavor. You could even try orange juice instead of lemon. Eating your greens raw is an acquired taste. I developed the taste for this salad with time. Including this salad in your diet couple of times a week is immensely beneficial. 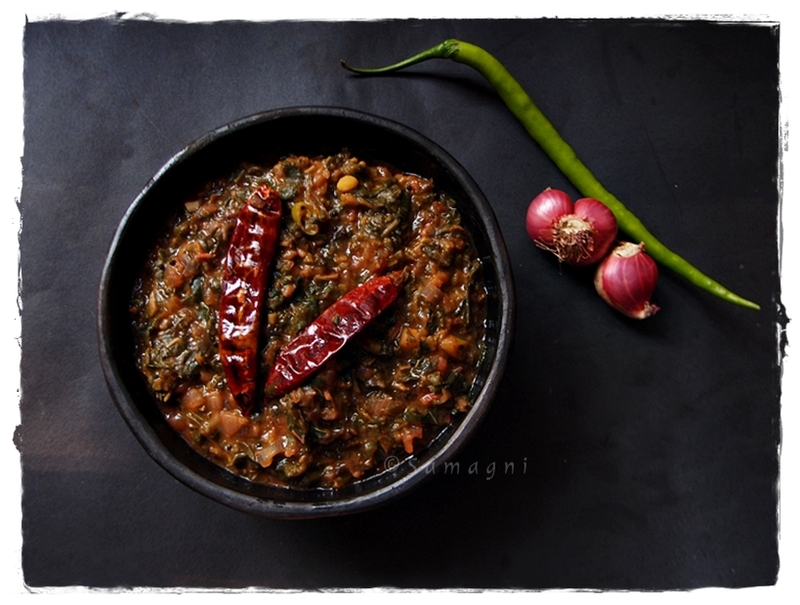 If you are unable to eat your spinach raw, you could lightly cook the leaf and add it to your pasta or add the spinach puree to your chapathi dough.